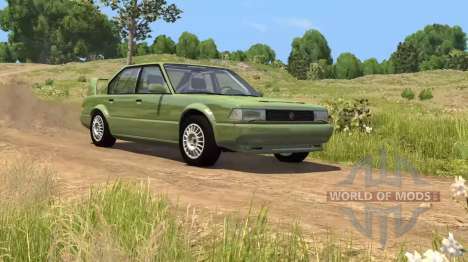 New update for the BeamNG Drive now available for download on Steam. Many new cool features come with this update. Read more in this article! Without further ado let's start enum the new features. Couplers. A new opportunity to hook vehicles together. Brakes thermodynamics - different types of brake pads, brake pads temperature, brake performance changes. Hotlapping - measuring lap time app. First version of experimental replay system. Replay files will only be available in the current version. Improved overall physical core stability. Added the ability to hook vehicles together. Brakes now use nodes of both wheel axes for brake reaction torque, if no "nodeArm" for brakes has been defined. This makes brake systems in the game behave more realistic. Phisics core won't execute LUA files while errors happen. Earlier it continued to execute these files, spamming the message log with error messages. Improved aerodynamics in the game. Fixed some bugs in collisions simulation. General environmental temperature can now be changed in physical core settings. Earlier the rate was rigidly pegged to the average Earth's temperature (15 degrees Celsius). Fixed behavior of spawning vehicles when simulation is stopped. Added new trailer for T-Series. Added a new bollard prop. H-Series: added new Ambulance variant, weakened driveshaft, added new 5.5 L V8 engine, fixed rear leaf springs could damage the hull. D-Series: added new rims and running boards (optional), weakened driveshaft, new 5.5 L V8 engine, the trunk is now openable. Roamer: a new running boards (optional), weakened driveshaft, added police spotlights, new 5.5 L V8 engine. Grand Marshal: added Taxi variant, added police spotlights and antenna, new 5.5 L V8 engine, added a adjustable race suspension. ’88 Pessima added vented hood, added wide body kit, new spoilers, added new skin "Custom", more damping on rally suspension. Moonhawk: now lettering on the car can be removed, weakened driveshaft, added "Race" variant with a custom suspension. Sunburst: fixed skidplate damage and deform bumper, new spoilers, added new front splitter, added widebody kit and Hill Climb variant, improved damping on race and rally suspension, rear suspension roll center lowered, some suspension parts were strenghtened. SBR4: fixed ABS not working, fixed speedometer limit, new widebody kit. Brake system temperature properties added to all cars. Now you can choose brake pads for all cars. Fake superchargers replaced with real ones, which use a new system of supercharger simulation. Bolide: more suspension damping, more realistic engine inertia, which makes it easier to control wheelspin. Barstow: added roll cage and other minor changes. 200BX: improved rear suspension geometry, which greatly reduced compliance steer on wide tires, Demon now has more stable handling. Covet: more daming ong race and rally suspensions. ETK K-Series: fixed some parts of the engine engine were in the wrong places, added missing radiator tubes, added indicators. ETK 800 Series: added missing radiator tubes. T-Series: now the front license plate won't go inside a heavy bumper, lowered spare wheel, reduced fragility of cargobox panels, fixed the instability of cargobox floor while the rear doors are open, other changes. Pigeon: fixed behavior of the front wheel (breaks or disappears). Improved ABS behavior for all cars. Reduced radiator strength for most cars (before it was almost indestructible). Fixed transmission behavior on rally cars. Fixed wrong wheels offsets on ETK F13 and Dreid RallyPro. Clutchtorque values removed from all car's engines. Now these values are auto-calculated by drivetrain. A lot of debug bindings now require clamping "Ctrl" to avoid accidental use. Now you can use left-shift key to increase camera speed. Improved recovery system ("Insert" key): the system now remembers your path even after reboot or re-spawning the vehicle. Improved handling on the keyboard: you can now choose between "Grip" and "Drift" filters. Fixed inability to invert mouse camera axis. Fixed unresponsive control keys while radial menu is active. Added a lot of new tips on loading screen. Fixed a variety of apps in the game. Improved many AI functions behavior. Added extensive perfomance stats for all vehicles. Improved the vehicle damage application. Some cosmetic changes in debug menu. Many new functions for different applications in the game. Fixed message about firewall blocking the game and prevent you from connect to Android controller. New icons for the content, which did not have such icons. Added new icons for Xbox controller bindings. Fixed hints and hotkeys' tooltips. And many other smaller changes. With each new update BeamNG Drive becomes more and more perfect, and simulation of various situations that can (or cannot) occur on the road, becoming more and more like real life. Besides, a great number of mods for BeamNG Drive, the widest base of which you can find in the corresponding section of our website, increase great possibilities of this unique game project even more. Stay tuned for the latest BeamNG Drive news.